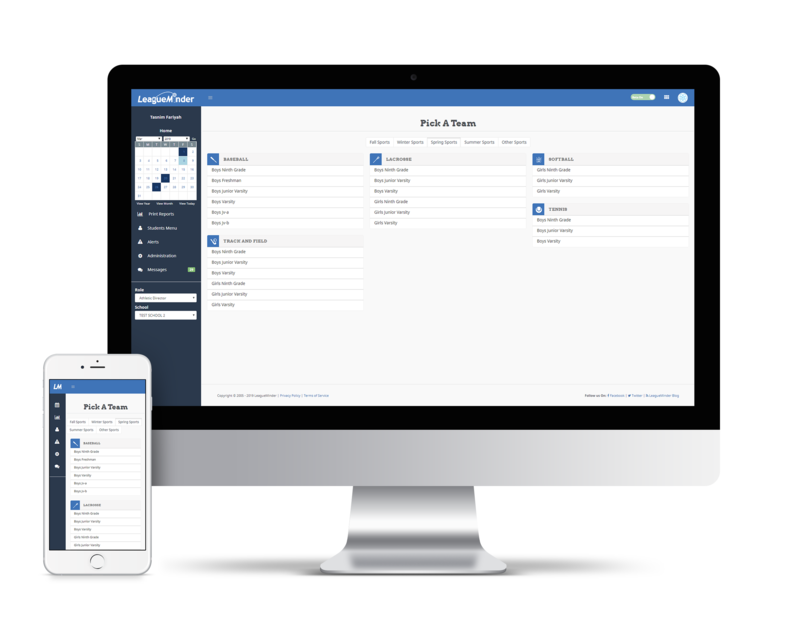 Designed for athletic directors by athletic directors (FADBADTM), LeagueMinder, gives administrators a competitive edge when managing their schools' athletic programs. Our Artificial Intelligence automates Activities Management to streamline daily communications and logistics. Simplifying your workflow for an easier workload. LeagueMinder is the only web-based solution that streamlines ALL communication, including native Apple and Android apps. We are the pioneer in providing the ultimate flexibility for schools to easily coordinate and communicate with their communities. Streamline recurrent administrative tasks so you can focus on your coaches, athletes and community. Automated communication keeps your athletic community in the loop. Coordinate schedules, rosters, facilities, buses and officials for all your programs. Our technology helps you gain a competitive edge with winning results. LeagueMinder is a “life saver” and I want everyone to know how beneficial this scheduling program is to my position as Athletic Director of West Chester Henderson. I have worked with many different scheduling programs over my 15 year career and I have to say that Leagueminder, which is a web based program, has the best customer support I have seen in the industry, it saves me valuable time, it’s easy to navigate and it reduces the amount of phone calls that we receive from our community. Simply put, LeagueMinder is the best I have used. I also would like to mention, as the scheduler for the fourteen schools Ches-Mont League, Leagueminder has enabled me to easily create our league schedule for all nineteen sports without any “heartache”. One of the best features that I love about Leagueminder is the fact that once I create the league schedule, I can release all the league games over the internet and they appear on our league members schedules. Our member schools do not have to input any league games into their schedules. LeagueMinder has provided athletic directors in New Hampshire with a product that meets their needs. The product is easy to use with great tech support and training as needed. I highly recommend it. Our league searched for months for a product that would help with endless scheduling needs. The LeagueMinder team was so enthusiastic to show us their product, and it is no wonder where this excitement came from! The system is exactly what our entire league needed. The automatic email verification feature of LeagueMinder eliminated phone tag in our conference and with several thousand events yearly, this is a major accomplishment! This is the most comprehensive and user-friendly system I have ever seen. The simplicity, ability to communicate effectively with everyone associated with contests, outstanding customer service and wide variety of features allows us to work as a team more efficiently. After working with the LeagueMinder staff for a brief period of time, we quickly learned why LeagueMinder is so successful – they have a great product and they work hard to make it even better! As longtime customers, we have been very pleased this past year with the renewed commitment DigitalSports has shown to Baltimore City Schools. The LeagueMinder product continues to save our ADs valuable time and money maintaining schedules, rosters, facilities and all of the other initiatives that go into keeping our athletic department strong and our coaches, athletes, parents and fans happy. Interested in what we have to offer? Click to find out further information on pricing and subscriptions. FormRELeaf dramatically reduces your registration workload and expenses while providing all users an unparalleled and positive experience. We cover your registration process from every angle! DigitalSports is a national forum for communities, schools and teams to share stories, photos and videos from the perspective of those who know the athletes best—parents, friends and faculty. © 2019 Leagueminder. All Rights Reserved.